The state government of Haryana has understood that for the overall development of the state, the government needs to put more stress on the progress of the villages. Thus, the state government had decided that every sitting MLA in the state will have to adopt three different villages and work towards the overall expansion of the rural area. The scheme was propounded under the BJP government and the name of the scheme is Vidhayak Aadarsh Gram Yojana. “Haryana government has launched many schemes for betterment of the state citizen. It has already been mentioned that the steps must be taken for the expansion of villages and developing the overall infrastructure of the rural areas. The main aim of the scheme is to bring about an overall development of the villages. It will not only increase the economic base of the rural area but will also establish facilities which are available in the cities. Thus, people will not have any problem in settling down in the villages. With the help of the program, the state government of Haryana will be able to ensure a greater participation of the common people. Without the participation of the people of the specific area, the developmental work of the villages will not be successful. The state lags behind in matter of gender equality and justice. Boys are still given a superior status than the girls and they are given special facilities of education than girls. The scheme will assist in removing gender bias. Highlighting the importance of the inclusive development and social justice is also a part of the scheme. If these are not provided, then the rural lifestyle will not be able to develop in the desired manner. The culture of each village in Haryana has some special feature that you will not find in the other villages. With the help of this scheme, the MLAs will be able to develop the special culture of the respective village. The implementation of the scheme will also assist the MLAs and the rural government in bringing about transparency in the governance. With it, the rural folks will know about the duties and responsibilities they have towards the village. As the development of the village will be closely monitored by the MLA and they will get monetary assistance from the state government. With the implementation of the program, the people will get a taste of self-governance. Increasing the productivity of the village – The prosperity of any village will depend on the money that the rural folks get by selling the produce. As the villages depend on agriculture, one of the mail, features of the scheme is to increase the productivity of the rural areas. Providing improved facilities to the villagers – It is the duty of the MLAs to look after the development of their chosen villages. Apart from developing the infrastructure of the rural area, they will also see that the villages get all facilities, which are available in the cities. Making the villages self-sufficient – With the overall development of the villages, these areas will go on step closer to attaining self-sufficiency. To acquire this, the MLAs will have to work towards using the funds wisely for developing the villages. Promoting human development – Development of the village is not the only aim of the program. The feature of human development has also been highlighted. Without the development of human life, the overall growth will not be possible. Eliminating disparities – People of the villages suffer from many disparities. Cast, status and other factors play an important role increasing negative differences. With the implementation of the program, it will be easier to combat these differences. Providing better living opportunities – Developing the villages is not the only aim of VAGY. Its features also include providing the people of the villages better opportunities of earning a livelihood to cater to the needs of their families. Expansion of agriculture – Long term development will not be possible if the rural folks restrain themselves in agricultural practices. Thus, diversification of cultivation is very important and it has also been mentioned in the feature list of the VAGY. No relation of the MLA with the village – Another feature of the scheme highlights that the MLA will not be able to select any village, with which he/she is directly or indirectly related. The MLA will have to pick a neutral rural area to eliminate all accusations of partiality. If you are interested in gathering details about the scheme Vidhayak Aadarsh Gram Yojana, then you need to check out the official website of the program. 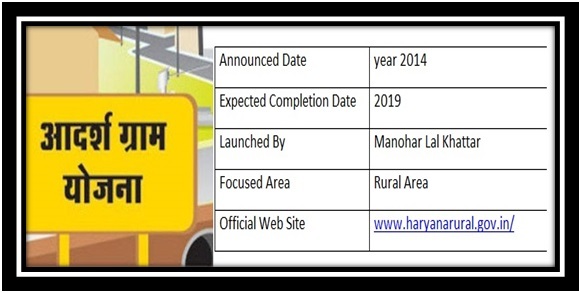 The link of the authorized web page is www.haryanarural.gov.in/. Prosperity and the development of the villages of Haryana rest on the promptness of the MLAs. The more time the MLAs take in selecting the villages and embarking on the actual task of implementing developmental activates, the more delayed will be the success of the program.